Pretzel Logic's Market Charts and Analysis: Market to Bulls: "Pay Me Now, or Pay Me Later"
Market to Bulls: "Pay Me Now, or Pay Me Later"
1) Near-term, I'm not certain if the rally has put in the final thrust or not. 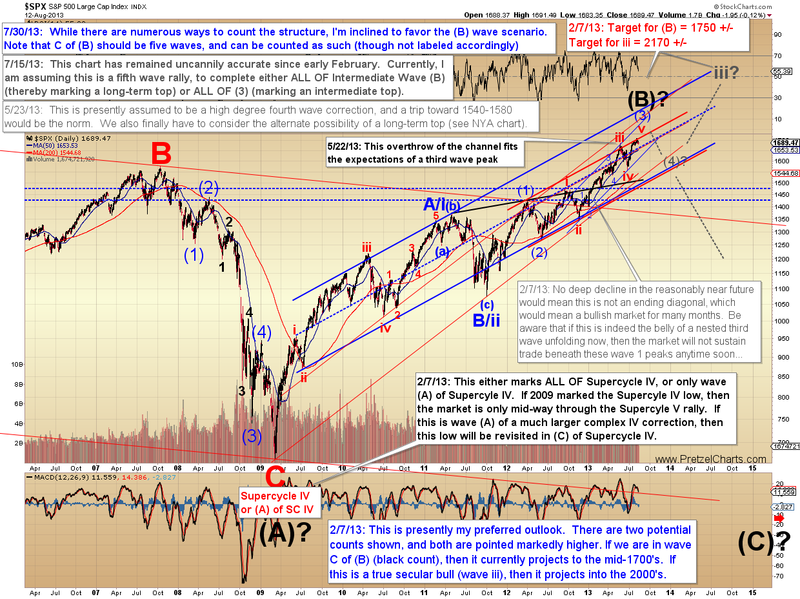 2) Intermediate-term, I believe the market will see a significant correction or worse. The question is whether that correction begins directly, or begins from slightly higher prices. My February target of the mid-1700's hasn't been negated yet. Whether that target is reached or not, I presently expect the market will ultimately end up trading below current prices over the intermediate term. 3) Long-term, we may or may not have another fourth wave decline and fifth wave rally to unravel, and we'll have to unravel that question at some point in the future. 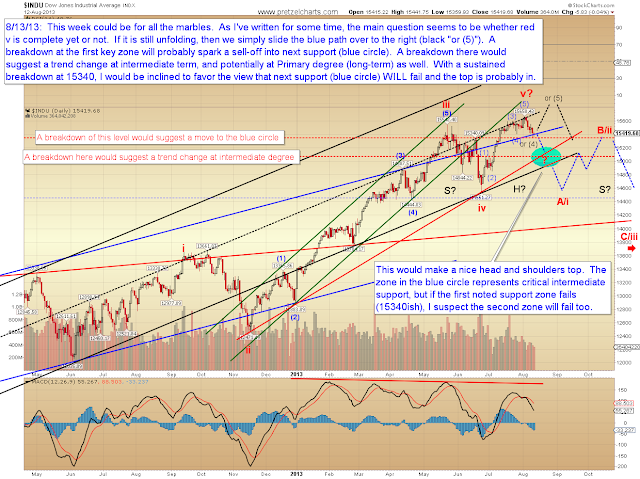 The potential exists for a major long-term top in this zone, and I'm presently a bit more inclined to favor that view. In any case, I believe the downside potential exceeds the upside potential relative to current price levels. While the near-term still allows for another wave up to new highs, I would be quite surprised if bears don't win this battle at intermediate degree. Hopefully that helps clarify my current stance, and it represents a material shift of my long-term stance in January. I'm no longer long-term bullish, but am now in "sell the rallies" mode until proven otherwise. 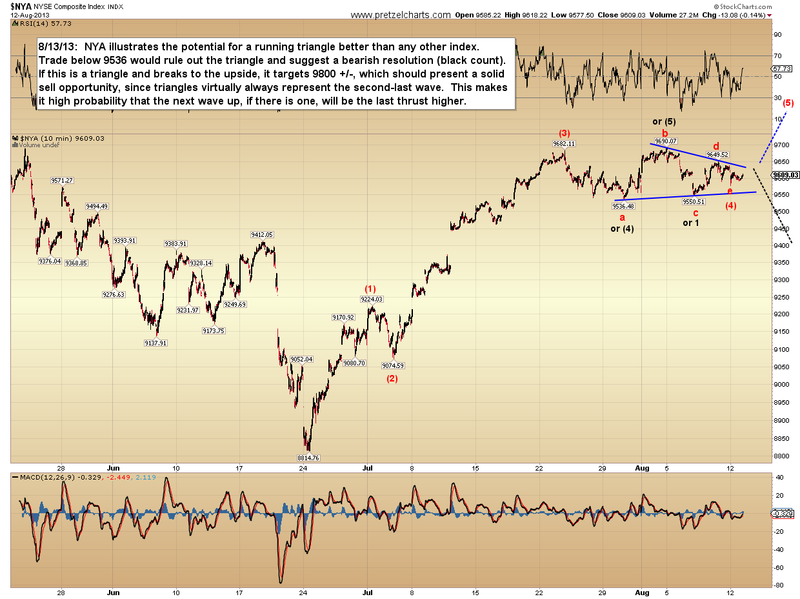 I've chosen the NYSE Composite (NYA) to help illustrate why I feel this way. 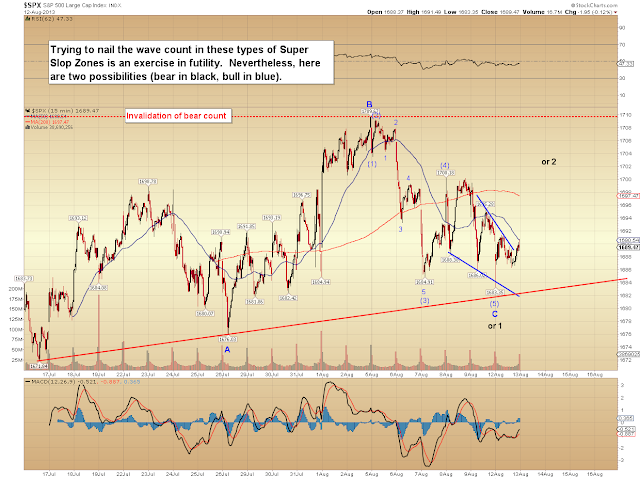 As I see it, the best-case scenario for bulls right now is a running triangle, which leads to a final rally wave. Worst case for bulls is the top is in already. Bears win both those battles at intermediate degree, but may want to await a breakdown in order to maximize probability. In other words, I'd be inclined to sell either at higher prices or at lower prices. Taking action directly in the middle of the noise range amounts to a coin flip. The S&P 500 (SPX) near-term chart illustrates essentially the same conundrum, from a near-term perspective. No clear break has left myriad near-term potentials. From higher elevation, the big picture seems more clear. The question remains whether red wave v is complete or not, but I would presently expect the downside targets should be realized either way. The first target of the most bullish count at intermediate degree is the low 1600's (shown by gray wave (4)). 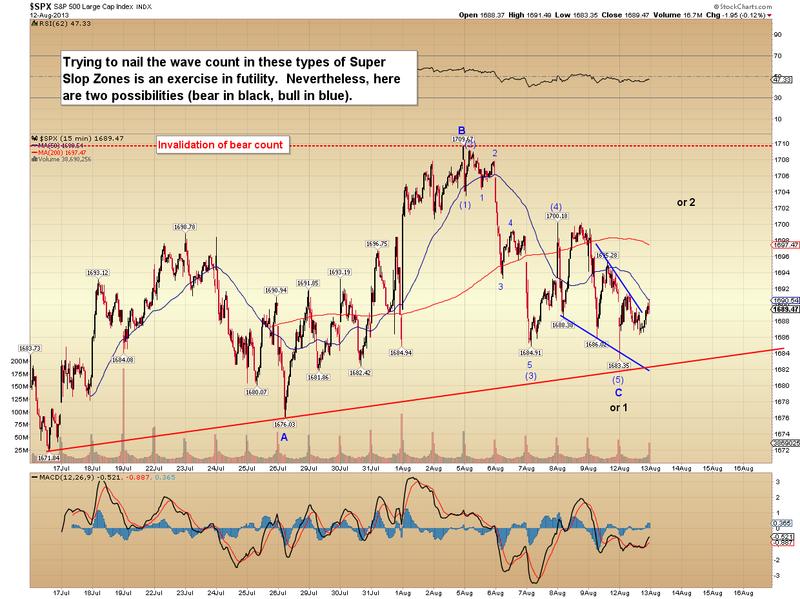 The most bearish count has a final target near the 2009 lows. I feel the chart of the Dow Jones Industrial Average (INDU) offers some reasonably clear levels. This chart also helps illustrate my view at intermediate degree. The best way I can express my sentiment regarding bulls' intermediate chances is to harken back to the old Fram oil filter ads -- "You can pay me now, or pay me later." In conclusion, I'm stepping out on a limb a bit here for my intermediate outlook, and not giving much airtime to alternate bullish potentials. Certainly those potentials exist, so there's no reason for bears to feel invincible or complacent. However, I feel those potentials are much lower probability -- in the range of 30% -- so in the interest of clarity, I'm minimizing my coverage of them presently. The big question the market has refused to answer remains the same as last week: Will we see a bit more upside before a correction (or worse), or has it already begun? Once the market clears the trading range, we should be able to again narrow down the near-term options. Trade safe. Reprinted by permission; Copyright 2013 Minyanville Media Inc.
months.....Perhaps more fuel for the bulls? As always, great analysis Pretzel. I truly enjoy reading your blog entries to help me understand the view from 30,000 feet--it is very easy to get lost in the trees trading the shorter time frames. Those bull wicks on the dips below 1684 cash certainly indicate there are "interested parties" buying those dips (for whatever reason) and it will likely take an "event" to push below those levels. Keep up the good work.